Can access Order Details page. Can see Order Edit History. Can view, copy link and print estimate and invoice pdf. Can customise job cards/checklists (master). Can access Garage Tags (master). Can access Garage Packages (master). Can also access appointments and can only confirm the appointments not reschedule and cancel; Can also convert the appointment to repair order. Can also set a reminder. All the accesses provided in VIEW INVOICE and CREATE INVOICE role. Can view the Inventory Screen. Can view the service and parts master. Can add the stock items. Can add new services and parts (master). All the accesses provided in VIEW INVENTORY and CREATE INVENTORY role. Can edit new services and parts (master). All the accesses provided in VIEW SERVICE AND PARTS role. All the accesses provided in VIEW SERVICE AND PARTS and CREATE SERVICE AND PARTS role. Can Send Payment due reminder and payment link. Can fully manage the Accounts. 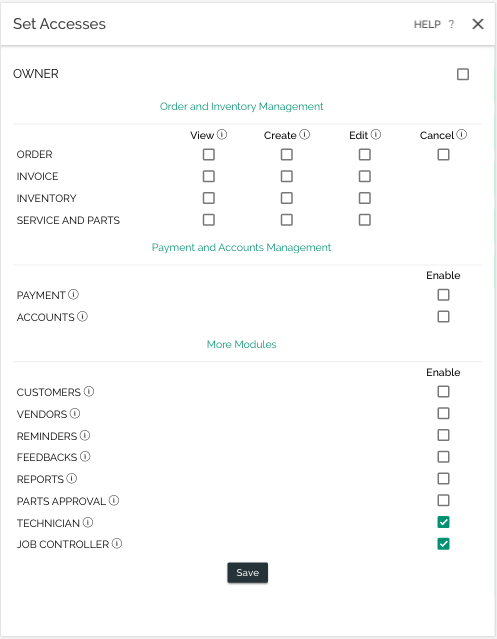 Can view inventory, manage parts approval process. Can view/manage reminders & Insurance due modules. Can work on the actual jobs or repairs and can perform time-in and time-out. Can assign jobs to technician and manage timesheets.